We’d love your help. Let us know what’s wrong with this preview of Defenseless Christianity by Gerald J. Mast. Entering a field of ongoing controversy, this book dares to offer a new model or vision—defenseless Christianity—for understanding Anabaptism, both present and past. An Anabaptism defined as defenseless Christianity should be seen as a nonviolent Christian movement with a world-reconciling theology despite the fact that some first-generation Anabaptists were not pacifists. Entering a field of ongoing controversy, this book dares to offer a new model or vision—defenseless Christianity—for understanding Anabaptism, both present and past. 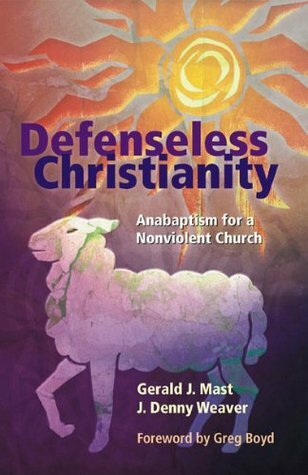 An Anabaptism defined as defenseless Christianity should be seen as a nonviolent Christian movement with a world-reconciling theology despite the fact that some first-generation Anabaptists were not pacifists. "My first reaction on reading Defenseless Christianity was, 'Them’s fightin’ words!' On further reflection, I’m gratefel for the gift Weaver and Mast have offered by provocatively addressing a host of issues in Anabaptist historiography and theology on behalf of 21st-century communities of Christ’s followers." —Nancy R. Heisey, Associate Professor of Biblical Studies and Church History, Eastern Mennonite University; President, Mennonite World Conference. To ask other readers questions about Defenseless Christianity, please sign up. Made many great assertions. With little evidence to back any of them up. Suffers from the same problem of many in academia in that it dramatically widens the scope of what it calls "violence" to include many scores of topics that are not actually violent, and many of which demonstrably do not exist, at least not in the ways their proponents argue. But very well written, despite its problems in certain particular topics.